From the outside, they bear little resemblance to humans--simple smiling face, bright yellow skin, strange plastic bump on their heads—but look inside a Lego minifigure and you will see that they have bones and organs, just like us. Well, only if you look inside the Lego man that Jason Freeny has sculpted. By taking a 7.4-inch Lego minifigure, cutting him open on one side, and molding a clay skeleton and internal organs, he has created a sculpture called "Mini Figure Anatomy". Over on his Facebook page, Jason posted various photos of the very intricate creation process of sculpting each vertebrae, rib, and organ. 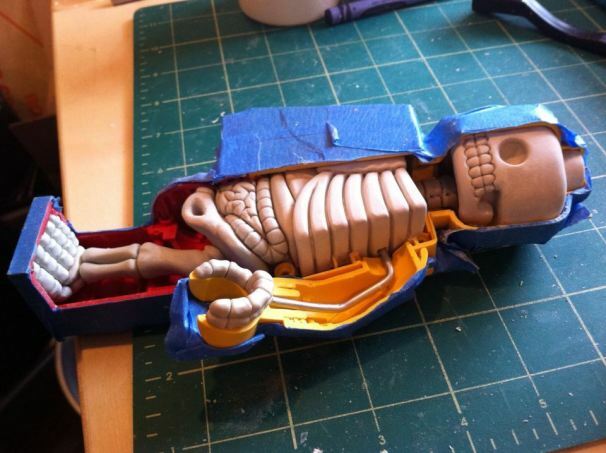 All the internal components are crafted so well, especially the tiny stomach, liver and intestines. I especially love the little teeth and tiny hand bones, which are shaped to perfectly match the C shape that is a Lego figurine’s hand. That said, the inclusion of kneecap is odd to me--everyone knows minifigures can’t bend their legs. Instead of being creepy or horrifying, the sculpture seems so innocent. It’s also cool way to understand anatomy and much cuter than those sculptures I remember from biology class.